Ahead of forthcoming Lok Sabha Election, where ruling party BJP is trying to shield themselves by attacking opposition and singing melody about their work, Opposition is uniting to make sure of ousting the saffron party from power. In this war of votes, Congress has found a new way to make a silent attack on the BJP government with a Valentine twist. As it’s Valentine week going on and today is Hug Day, the Congress today used the occasion to take a clean and sarcastic swipe at the BJP. 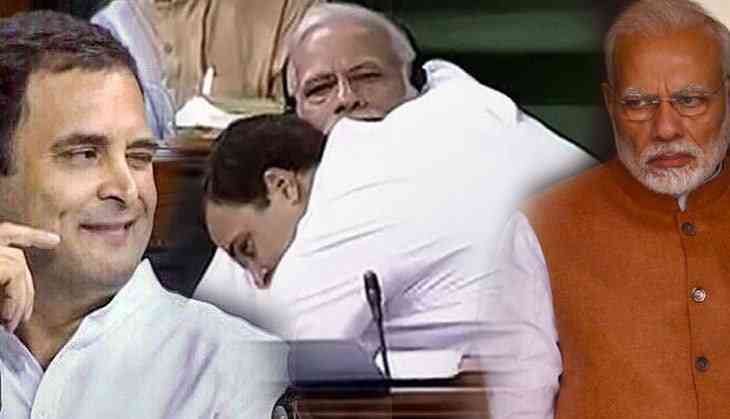 The Congress used video of Rahul Gandhi hugging Prime Minister Narendra Modi during the monsoon session of parliament last July. "Today our message to the #BJP is simple: Hug, don't hate," the Congress posted on their Instagram feed. The video has garnered over 37,000 views and 12,000 likes so far. All may remember when Rahul Gandhi walked across the Lok Sabha to hug the PM Modi during a heating debate on No-Confidence Motion between the ruling National Democratic Alliance and the Opposition had left many stunned and caught PM Modi off guard. "I realise he (PM Modi) disagrees with me and I disagree with him, and I will fight him and I will try and make sure that he is not the prime minister but I don't hate him. I give him the right to have his opinion," the Congress president Rahul Gandhi said a couple of weeks ago in Bhubaneswar.